Several of you have asked about the Atelier de la Rose accommodations and studio. The studio is spacious, with multiple work surfaces, easels, portable stools we can take out for plein aire painting as well as chairs to sit in and divan for lounging. There are brushes and some paper and miscellaneous still life objects. Sally Gaucheron, our hostess has even provided me with a large metal plate that was once a cover for her stove, which she saved thinking that someday one of her visiting artists might have a use for it. It works perfectly as an easel board for me and allows me to use magnets to hold my pastel paper securely while I’m painting. Here are a few photos of our space. 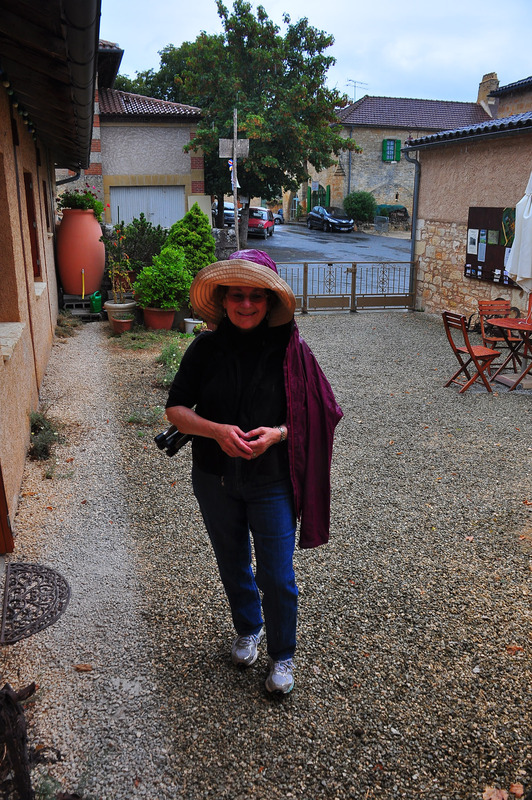 And this is me, returned from a hike in the rain, standing outside the gallery in the second patio where we sometimes have our meals. This entry was posted in Art, Jean's Posts, Uncategorized and tagged Atelier de la Rose, Jean Sullivan Artist. Bookmark the permalink.